Batteries for hybrids and plug-in vehicles are growing fast, more than tripling over the past three years to reach 1.4 GWh per quarter, according to the Automotive Battery Tracker from Lux Research. Panasonic has emerged as the leader thanks to its partnership with Tesla, capturing 39% of the plug-in vehicle battery market, overtaking NEC (27% market share) and LG Chem (9%) in 2013. "Even at relatively low volumes -- less than 1% of all cars sold -- plug-in vehicles are driving remarkable energy storage revenues for a few developers, like Panasonic and NEC, that struck the right automotive partnerships," said Cosmin Laslau, Lux Research Analyst and the lead author of the new Lux Research Automotive Battery Tracker. "To understand this opportunity, we combined a comprehensive data set of vehicle sales with detailed battery specifications for each car and supplier relationships, yielding a flexible tool that uncovers unexpected insights into this fast-changing market," he added. The electric vehicle drivetrain is the most lucrative for battery developers. Hybrids move the most cars -- the Toyota Prius is the best-selling car in Japan and California -- but their small battery packs mean they require less energy storage in total than full electric vehicles like the Nissan Leaf. 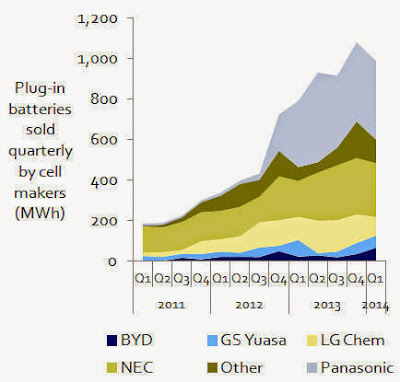 Hybrids demanded 481 MWh of batteries in Q1 2014, while electric vehicles called for 774 MWh. Nonetheless, in terms of demand by OEM, hybrid leader Toyota (28%) edges EV providers Tesla Motors (24%) and Renault-Nissan (21%). Regulations and consumer preference drive significant regional differences. China has the highest ratio in the world of plug-in vehicles to hybrids, but its average EV battery packs are less than half the size of those sold in the U.S. Adoption of hybrids also varies widely: Japanese consumers bought more than three times as many hybrids as U.S. drivers did, despite Japan being a much smaller automotive market overall. Lithium-ion extends its lead, but NiMH sticks around. Lithium-ion batteries captured 68% of the 1.4 GWh of batteries used in plug-ins and hybrids in Q1 2014, with nickel metal hydride (NiMH) technology trailing at 28% -- but kept aloft by Toyota's loyalty to the lower-cost technology for its top-selling Prius. Next-generation solid-state batteries continue to make only a small dent, with less than 1% of the market.